Gina Rossi Armfield is back with a new book that follows the same style as her earlier and popular book No Excuses Art Journaling: Making Time for Creativity. 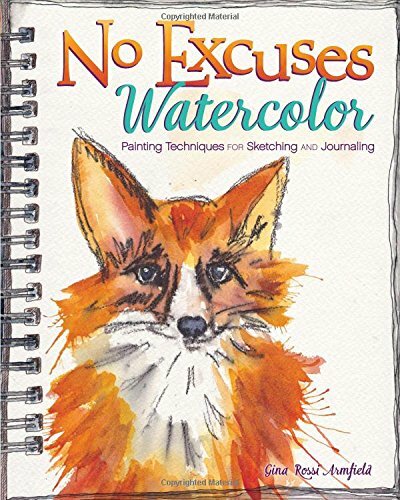 No Excuses Watercolor is a beginners workbook on using watercolours for sketching and journaling. In a sense, it's almost like her earlier book, except here it focuses on watercolours, and there are more exercises. First part of the book introduces you to the tools. It assumes no prior knowledge with watercolour. It suggests the tools that you can get and colours to use. The traditional techniques like creating a wash, wet-on-wet, using masking fluid are only briefly mentioned. The highlight would be the hands-on exercises where you get to draw something, in this case, fruits, owls and trees, and then filling them with watercolour. The step-by-step demonstrations are simple and easy to follow. The examples look loose and there's no stress on getting it right because there's no right or wrong. There's also a section that talks about using text in your sketches. The tutorial section is indeed short. That's because the third and final section offers several pages of ideas to help you brainstorm for things to draw. There are ideas for subjects, suggestions for colour palette and even quotes that you can write on your sketches, if you want to of course. No Excuses Watercolor is an accessible book for anyone who wants to play around with watercolours or get started with sketching and journaling. It's not a very technical book so you might still need another book if you want to improve your drawing skills — I suggest you get Keys to Drawing as well.